We are focused on helping people with their financial needs through Collateral Pawn Loans. We are “People Taking Care of People” and love to help our community with their financial needs by providing collateral pawn loans, purchasing their goods, selling precious metals, and providing free consultation for the value of their goods. We accept almost anything with a resale value greater than $20. Get a collateral loan or sell to us by using your electronics, luxury goods, jewelry, gold, name brand items, and much more. Bring your item to our Fairview store and let’s get started. Sam’s Locker is Idaho’s top pawn shop because of our many options to help our customers. We can offer you a pawn loan, or buy your item outright. We typically loan or buy at 30-90% of your item’s used resale value. Just pay your loan back with interest to enjoy your valuables once again. All loans come with the option to renew as many times as you’d like. If you can’t pay the whole loan on time, simply renew your terms with us, and we will work with you to extend your loan so you can eventually get your item back when you are able to pay. Bring us almost anything of value. We’ll loan you top-dollar for electronics, luxury items, jewelry, gold, or the latest devices. We’ll consider loaning on anything of $20 or more resale value. A pawn is a loan secured by “Collateral” offered with a fixed term. The process is very quick, and extremely confidential. We will beat any local competitors rates; we guarantee it. If you just want to sell your item, we will buy your item outright. We typically offer 30-90% of the item’s value. This depends on the type of item, brand and how fast the item will sell. 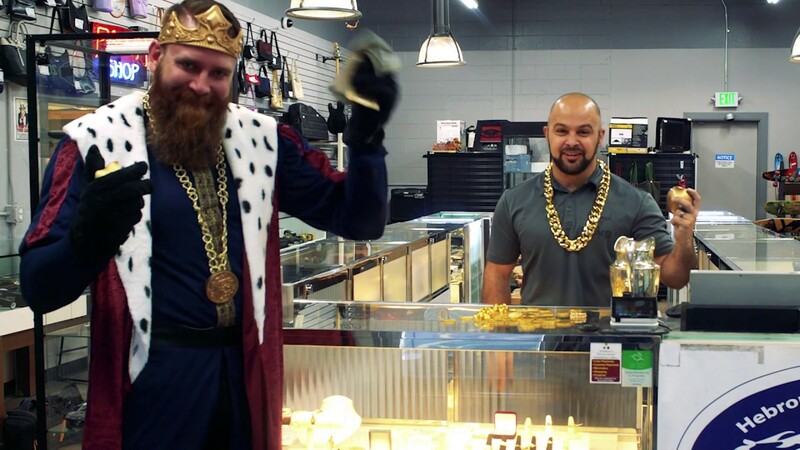 We always pay top dollar for gold, and pay higher than any store in the Treasure Valley. We list 95% of our items for sale on our website at www.208sale.com. You can make offers on items, buy online and pick up in store, or have us ship the item. At Sam’s, we love to sell our customer’s high quality goods at reasonable prices. While we love when people call us, please refer to our website’s list of inventory for all inventory-related questions. This allows us to provide the best service we can to our customers. If you aren’t comfortable online, come on down and see us, we would love to help you in person and get to know you as a customer. We sell your item for you and keep 10-20% of the sales price, returning 80-90% of the sales price back to you. We offer fixed rate consignment payouts also. You will get the most out of your item(s) this way. On trades we offer a higher payout for your item as long as we are trading up in value. This is typically the best route to get the most value out of your item. We buy gold in Boise and offer lab quality results with our XRF Analyzer. Precious metal scans are FREE. We offer the most % on spot price (market price) in the Treasure Valley. We buy quality diamonds in Boise, and offer free testing to authenticate your diamond. Need a certified report? We can help with that, it takes just 10 days. Have you purchased a firearm online, and need a dealer to ship it to? We can help with the transfer process and only charge $15. Yes we even help with resume writing. We have partnered with The Owyhee Writers League to bring our customers a very affordable resume service. OVER 400 5-STAR RATINGS & POSITIVE REVIEWS ON GOOGLE! For the nearly five years we’ve been in business, we’ve strived to live up to our founding principle, “People taking care of people.” That idea is something we try to live up to every day, and with every customer; it truly is the foundation of our work. Because of this, we work hard to make sure we have the best customer service around, and that everyone leaves our store satisfied. These guys have always been super friendly and professional, very honest about pricing and have always done the best they could to help me out with pawns and sales! Jeremy especially, he even remembers my name after just one other visit I had made and is keeping me smiling and laughing while helping me with whatever I came in for, and goes above and beyond to respect and keep my privacy. I most definitely recommend this place over any other! I have never had a bad experience here. We are a Veteran Owned & Locally Operated Business and have been voted as the Best Pawn Shop In Boise, Idaho.